The culmination of this work is (Un)Knotted—the OCAD U activation of Sexual Assault: The Roadshow, a traveling exhibition led by Professor Lilian Allen and sexual assault activist Jane Doe, featuring community-led art that prevents and responds to sexual violence across the province; and an accompanying zine, designed to work through some of the grounding principles that drove this work. The Public’s Sheila Sampath worked with the students over a four-week process that named and un-packed some of the systems that perpetuate violence in the OCAD community. 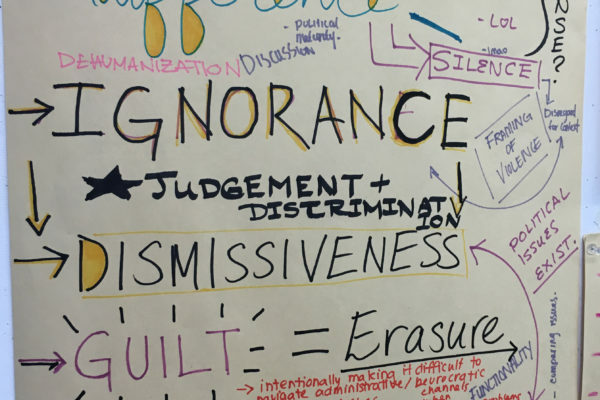 Using art and design, they envisioned the concepts of allyship and solidarity, and developed grounding principles to inform models for bystander intervention and the co-creation of safer spaces on campus. 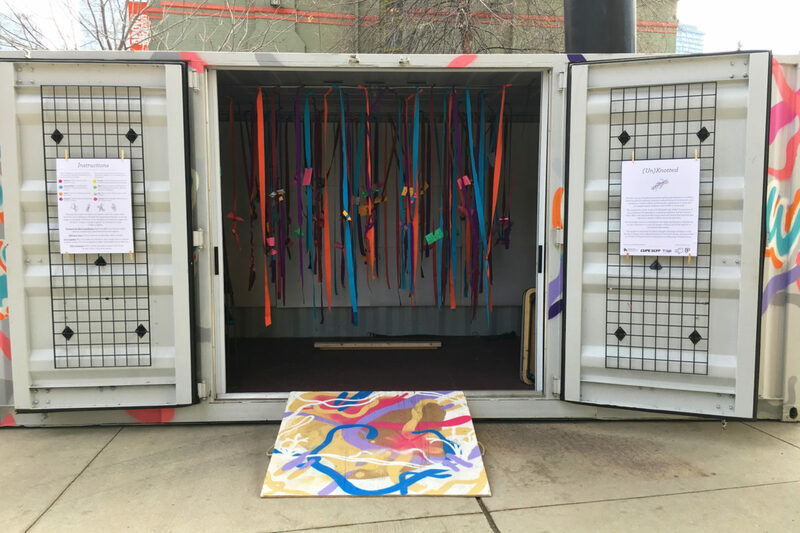 Together, they designed and created (Un)Knotted, a participatory installation. Over the course of a week, members of the OCAD U community were invited to contribute to the installation, participate in dialogue as a public response to on-and-off-campus violence, and work together to re-imagine safer spaces. 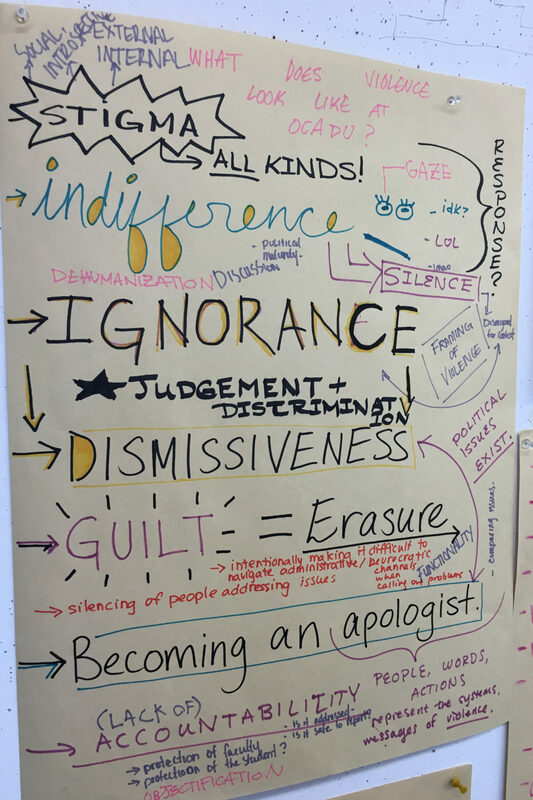 Each interaction was represented by one of four coloured pieces of paper. 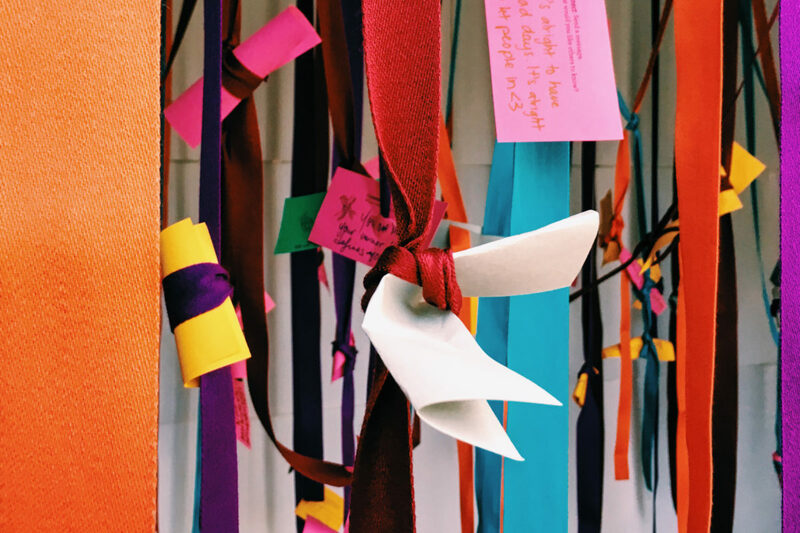 Community members were invited to knot the pieces of paper into the fabric, tie threads together, and collectively transform the space to a web of complexity that allows us to explore the nuances of sexual violence and bystander intervention on campus. The themes of solidarity, accountability, safety, and empathy were explored through four potential actions. 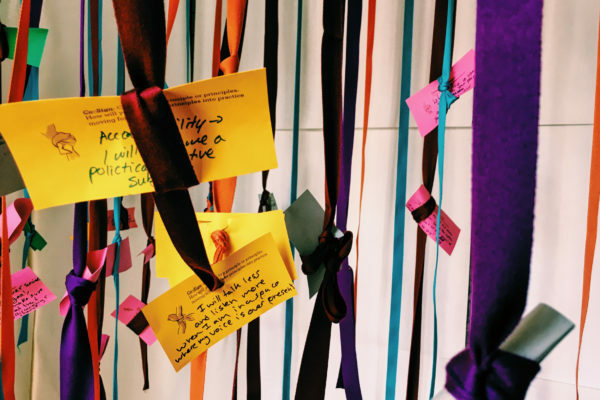 Participants were invited to co-sign or commit to a principle, share an experience, ask a question, or connect with others by sending a message. To document the process, show, and ideas behind Unknotted, The Public designed a book that chronicles the tools and practices students engaged with in the creation of the project, and the community responses generated through the space, in the spirit of continuing to build a co-creative and holistic culture of safety.